Can we begin this post with a big “I can’t believe my baby isn’t a baby anymore? !” It seems like just yesterday I was rocking him in his nursery, and now he’s got a queen sized bed in his room. I’m not quite sure how this happened! One of the pet peeves I have it that people always seem to have dreamy (pink) spaces for their little girls (our little girl space wasn’t quite pink though! ), but their boy rooms just don’t have the same appeal. 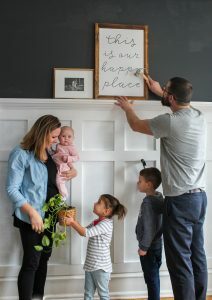 I am working on creating a space that my son will love, and will use! It’s also important that I design a space that he can grow into. My son is adorable. And utterly, completely, obsessed with balls. I mean, give the kid balls and food, and he’s your friend for LIFE. 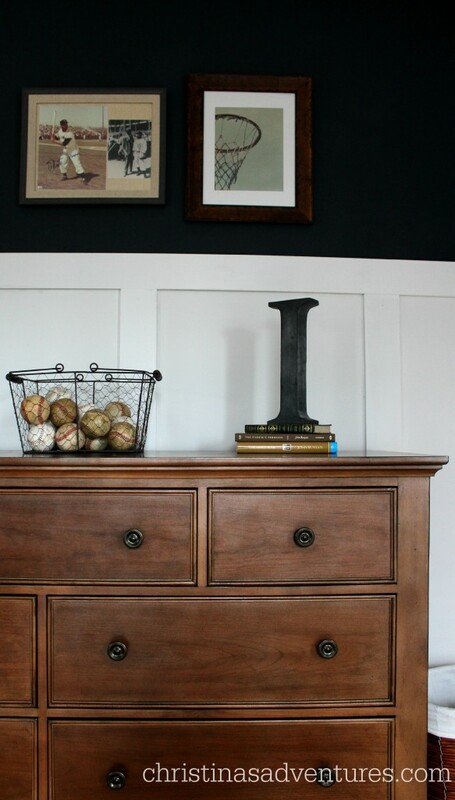 A sports themed bedroom can easily look cheesy, so I am working on adding vintage sports touches to this bedroom. We got signed baseball pictures from my father in law, I edited a stock picture I found online of a basketball hoop to make it look vintage, and I bought some old baseballs on eBay. We’ve already had many talks about how the balls stay in the basket – and we can’t throw them. Ha! 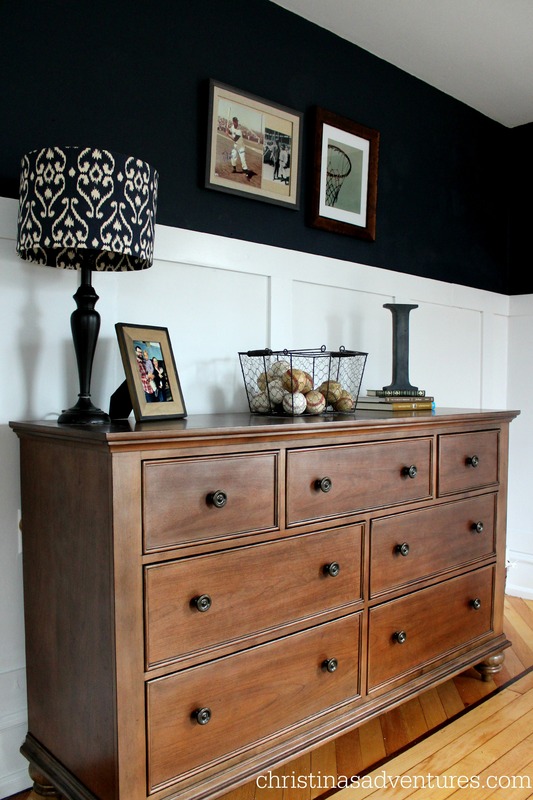 I really love our giant dresser from Raymour & Flanigan – it’s such a great size and it’s such a great piece in this room! One of my favorite things in this room (and what took the most time) was the board & batten wall treatment. I have always wanted to add this feature in my house, and I was thrilled to use it in Isaac’s room! 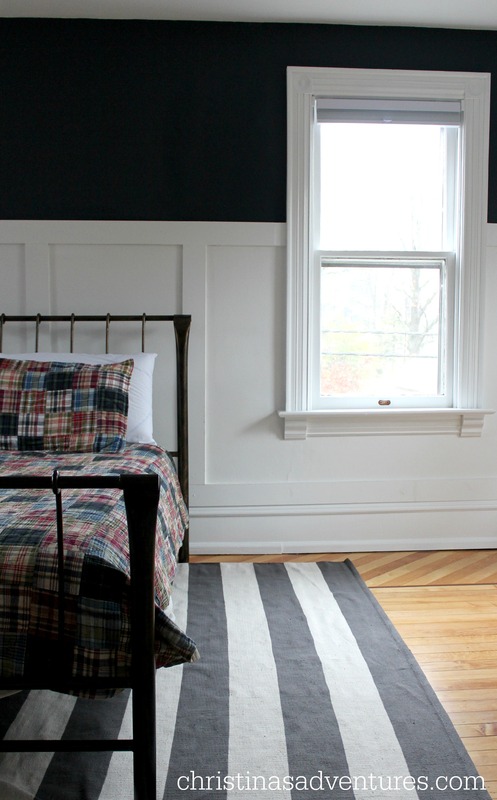 I just can’t get over the hale navy (that we also used in our bathroom makeover) and the crisp clean white. I have great plans for this little corner! Not only does my son love balls, but he really loves reading. Be still, my teacher heart! For right now, this corner functions well for us…and you know I’ll share what we do with it when it’s finished! After we got our new mattress, we gave our son our old mattress. Which happens to be a queen. I still can’t believe he’s got a queen bed in his room! Full disclosure: he’s not actually sleeping in it yet. He’s just not ready (and neither am I!!) so we still have his crib in the corner of the room. 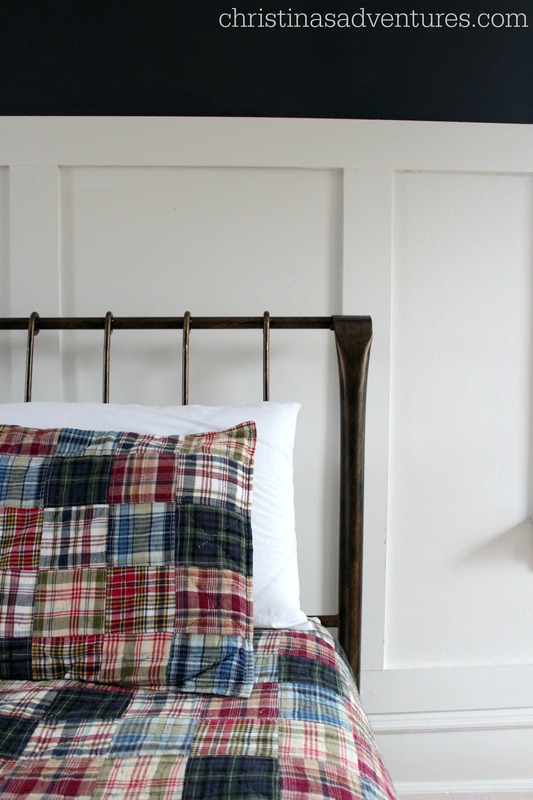 This plaid bedding works so well for a little boy’s room – and it was actually our bedding from when we first got married! So glad we can use it again. This bedroom is now one of my most favorite spaces in our house. 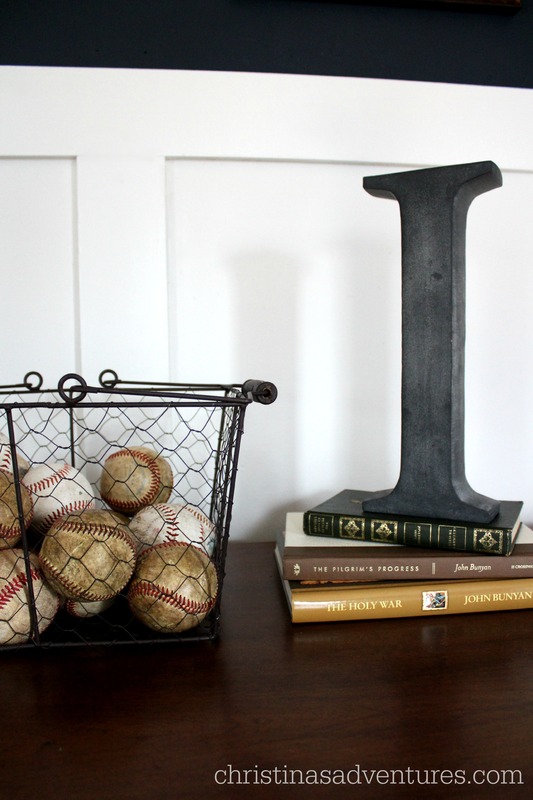 Decorating for boys doesn’t have to be ugly, cheesy or boring! I can’t wait to add some more DIY decor to this room, but for now, we’re loving snuggling on the bed for night time stories as a little family of four. Bed frame: Home Decorator’s Collection Outlet – no longer sold. Sad! I am so thankful to Raymour & Flanigan for providing me with the dresser for this bedroom. As always, all opinions are 100% my own. This post also contains some affiliate links. Full disclosure here. Nicely done! I especially love that its not overdone. You’ve really struck the balance of cozy yet uncluttered, simple and unique. 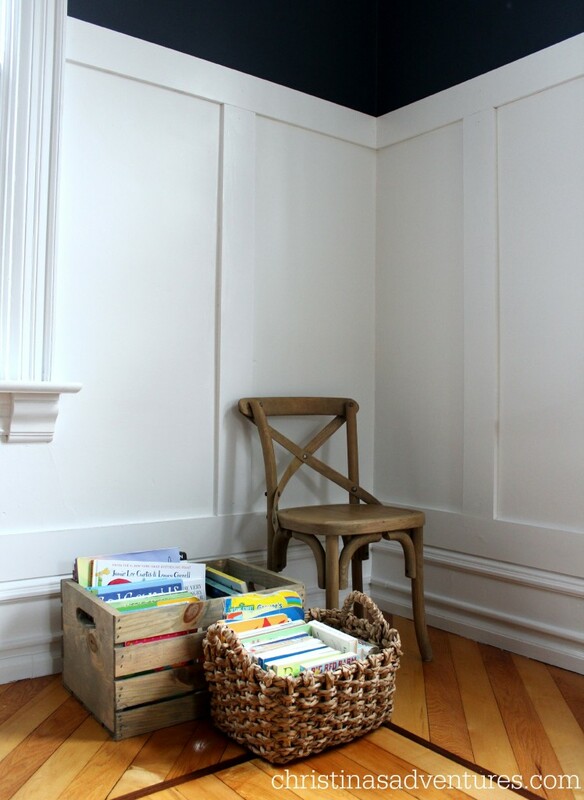 I love the reading corner, Brava! That means so much to me, Anna! Thank you! When hubby and I had our son, my thoughts were exactly the same and we wanted to create a space for him to enjoy and that he can grow into. Your designs are so inspirational and you’ve got a great eye! Love the room, especially the fact that you can have a solid wood, non-Ikea I like Ikea – not judging, just comparing) dresser in a boy’s room. 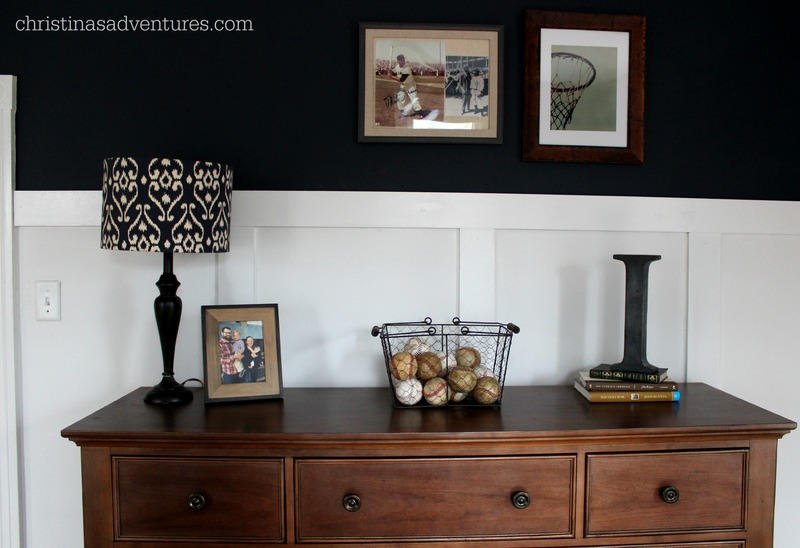 What paint brand did you use for the navy walls? So lovely! I love the plaid with the striped rug! Definitely a room that can grow with him and love the batten! I agree with you–boys bedrooms do not have to be cheesy. I love your son’s bedroom. The navy and crisp white pair beautifully together. It is masculine and sophisticated, yet the accessories work for a young boy. 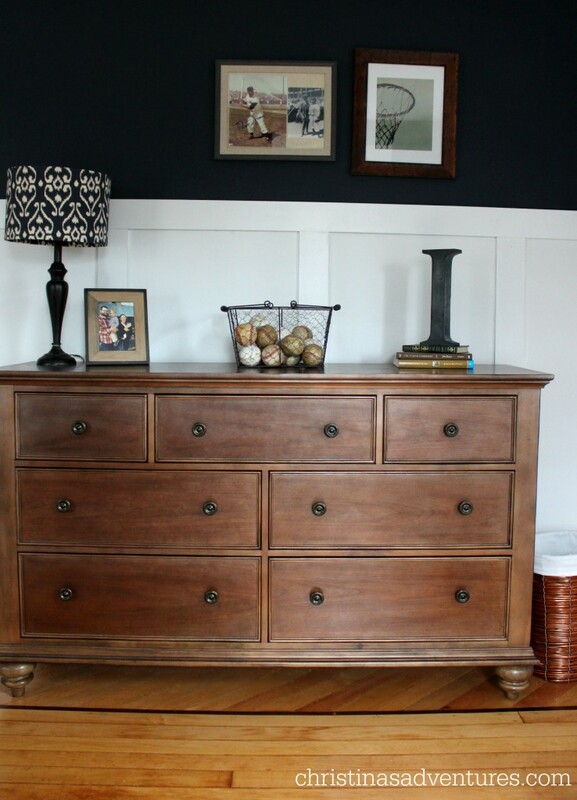 I think my favorite piece is the dresser–great piece. Thanks for sharing.